Fourteen local touch rugby referees have graduated with a Level 1 Badge after a three-day assessment. 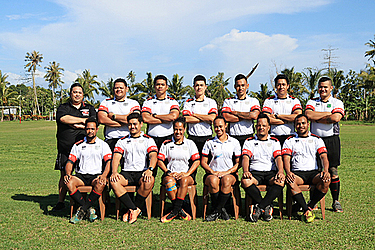 They are Gerard Anapu, Filoi Eneliko, Atitoa Tau, Risty Fong, Frank Ah Kuoi, Arron Rogers, Alex Mikaele, David Solomona, Tua Toomata, Deejay Fong, Michael Wulf, Mathew Stanley, Ete Tanuvasa, and Malaeloa Filipo Soe. The assessment comprised of five hour theory and test session which was held at the White House Hotel Fugalei. Then there was two hours practical session at the National University of Samoa followed by on field assessments, conducted during the Nofoali’i one-day tournament at Nu’uausala College (see story page 17). The core parts of the level one course consisted of covering the areas of creating career pathways, ways to progress to the next level and what skills, characteristics, attributes and commitment levels that participants will require and additionally it will touch basis on a lot of in depth technical information. The training was conducted by trainer Ioane Mita who is the Samoa Touch Rugby Incorporated (S.T.R.I.) Assistant Referee Director and assistant trainer, Gerard Anapu – S.T.R.I. Referee Director. President of S.T.R.I., Mailata Michael Wulf, said the training is critical for the development of touch rugby. Associate Referee Director, Ioane Mita, said it is significant for Samoa to have its own local officials who can also go on to represent Samoa by officiating international tournaments.